Posted 16 May 2013 in Not Kirby. The Kirby Museum was proud to have received some photos from then-Trustee Lisa Kirby of the 1976 backstage meeting of Paul McCartney and Jack Kirby. 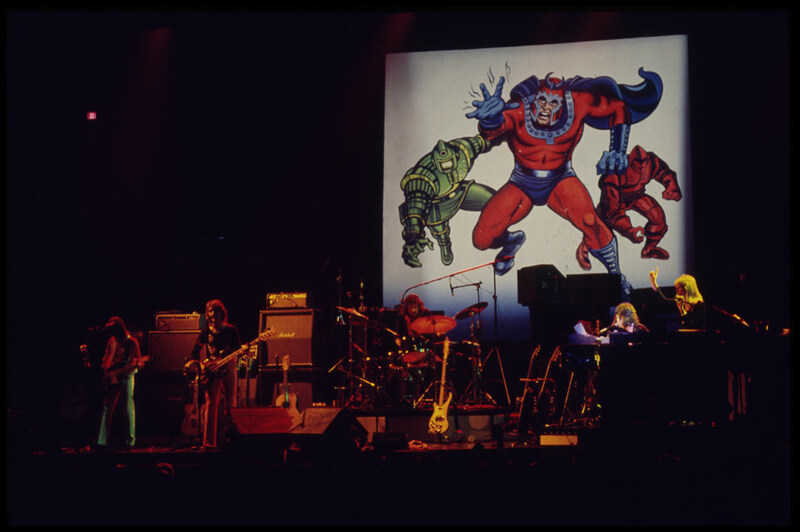 Unfortunately, there are some that believe that McCartney hired Kirby to produce the artwork that appeared on stage during the performance of “Magneto & Titanium Man” during that tour. So, there you have it. The source images are, from left to right, by George Tuska & Mike Esposito from Iron Man 22 (February 1970, on sale December 1969) , George Tuska & John Tartaglione from X-Men 91 (December 1974, on sale October 1974) and Sal Buscema & Joe Staton from Avengers 130 (December 1974, on sale October 1974). Any of these three comics may very well have been some of those that kept McCartney “from going bonkers” by “keeping their kids entertained”1 in Jamaica while he was writing, as McCartney described the genesis of the song. The “Venus and Mars” album on which the song appears was recorded November 1974 – March 19752. Or the comics just may have been those available to the artist who pulled the backdrop together. woo hoo! yeah yeah yeah! hi hi hi! Even as an 8 year old I used to get annoyed when people said this backdrop was a Kirby image. But I know how it happened. The news of McCartney’s Venus and Mars track made the news pages of Marvel’s monthlies and this was followed by news of Jack’s meeting with him. 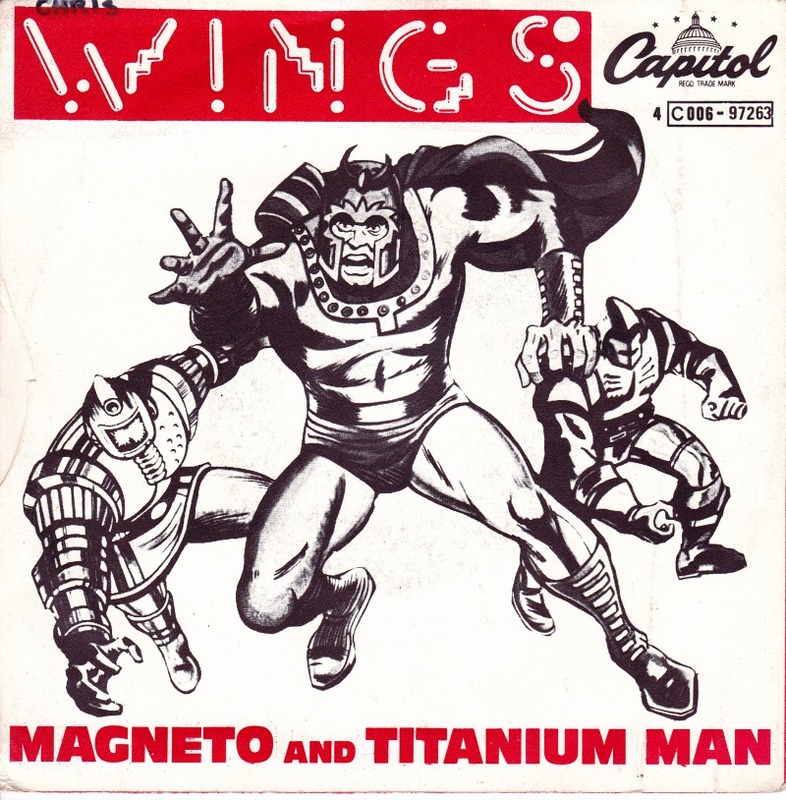 This, incidentally, led me to discovering McCartney but not til a year later as I didn’t yet understand singles and LP’s and was disappointed that a single of Magneto and Titanium Man didn’t appear. It was some years before I heard it but the following year I fell for the charms of ‘Let ‘Em In’, the first single I bought. Soom after that comics were somewhat over as I was then saving money for a bass guitar!